Today’s #VeteranOfTheDay is Thomas S. Monson. As he approached his 18th birthday in 1945, Tom enlisted in the U.S. Naval Reserves and anticipated serving in WWII in the Pacific theater. Tom was sent to San Diego for training, but with the end of World War II was not stationed overseas. His tour of duty ended six months after the end of the war, after which he returned to the University of Utah. After college Tom rejoined the Naval Reserve with the goal of becoming an officer, and he received a commission acceptance letter from the Navy. Realizing military service would get in the way of his volunteer church assignments, he declined the commission. This decision would define the course of Monson’s life, as he later impacted millions through his church work. 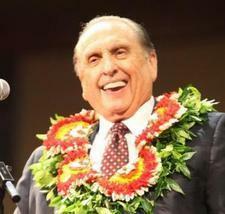 Thomas S. Monson became known worldwide after more than 50 years as a religious leader, and served since 2008 as president of The Church of Jesus Christ of Latter-day Saints. Monson used his Navy experiences to teach, like this story about honesty. After three weeks of intense training in boot camp, Tom and his fellow Navy recruits were given their first liberty to San Diego. All who knew how to swim were to line up for the bus to San Diego. The rest were to remain behind for swimming lessons. Just before the “swimmers” boarded the bus, the officer changed their orders — all recruits were to march to the gym, remove their street clothes, jump into the deep end of the pool and swim to the other side. Tom was a fine swimmer, but it quickly became obvious that about 10 of the men had lied — they wouldn’t jump into the pool. The officer pushed the remaining men into the pool and let them sputter under the water a few times before rescuing them with a pole. The lesson: telling the truth can save your life. Thomas passed away this week at age 90. We honor his service.